A Giveaway Good Enough to Eat: Chocolate and Spice Bakery Recipe Book Contest! On Friday, Chef Megan Romano of Chocolate & Spice Bakery was the subject of a Q & A on the blog and answered all sorts of questions about her bakery, her desserts and more. Chocolate & Spice is one of my favorite bakeries in Las Vegas, and is a great option for not only wedding cakes but for wedding favors like truffles as well as wedding cake alternatives such as pies, cookies and more. Plus, it’s available as a private event space to host rehearsal dinners, wedding showers and small wedding receptions, with a delicious catering menu for such events! 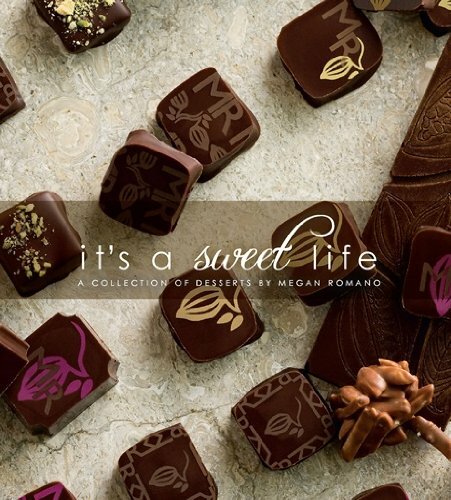 Megan came out with a recipe book in 2010, and it’s a classic.”It’s a Sweet Life” features stunning photographs of some of Chef Romano’s favorite desserts including ice creams, cakes, chocolates, cookies and more. The book allows you to explore sweet creations made with pure ingredients, balanced flavors and elegant form. Never too sweet, certainly never boring, Megan Romano’s “It’s A Sweet Life” opens up exciting new possibilities with delightful desserts for all to savor. And now, a digital copy could be yours! Chef Megan Romano has kindly provided a digital PDF copy of her latest book to giveaway to one lucky reader. Enter to win by using the widget below to share your name and email or log in with Facebook. In addition to a standard entry, you can get additional entries by liking and following Chocolate & Spice on Facebook, for pinning an image to Pinterest, or leaving a comment below on the wedding cake flavor combo you’d most like to try from Chocolate & Spice. (Here’s a HINT!) You also get extra entries for referring friends. Prize: One lucky reader will win a PDF digital copy of Chef Megan Romano’s book “It’s a Sweet Life”, valued at $35. This book includes recipes and photographs of dozens of stunning desserts and sweet treats. To Win: One winner will be selected at random via Punchtab Sunday October 6 2013 and announced on the blog on October 7 2013. The prize will be emailed. To Enter: Use the widget above to make entering easy and cycle through the options at the bottom extra times. In addition to a standard entry, you can get additional entries by becoming a fan of Chocolate & Spice on Facebook, for pinning an image to Pinterest, or leaving a comment below on the wedding cake flavor combo you’d most like to try from Chocolate & Spice. You also get extra entries for referring friends.